The day you exchange vows and say “I do” to the love of your life is priceless. As the bride to be, you will be highly interested in looking your best on the day of the celebration closest to your heart. 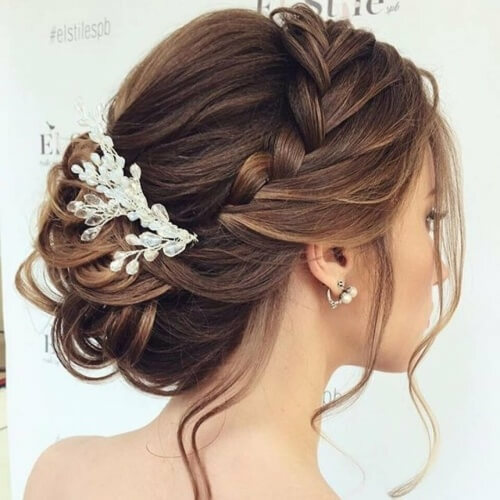 To allow you to focus on the dress, jewelry, and makeup, we have selected tens of wedding hairstyles for long hair that will help you complete your dream look. Get inspired below! They say that true elegance lies in simplicity. Sometimes, this can be the case for bridal hairstyles too. 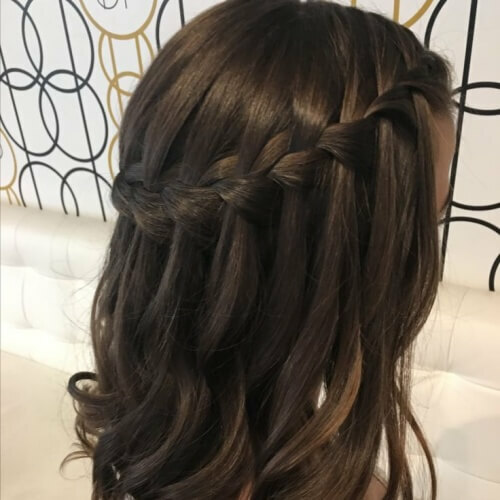 If you have an intricate wedding gown or dark eye makeup, you may want to consider wedding hairstyle for long hair with soft curls resting on your shoulders. Nowadays, a lot of brides choose to curl their hair for the big day. You can create picture-perfect curls with the help of a curling iron or rollers, or by braiding or twisting your hair. Make sure that you gently pull the curls apart to get a natural effect. Oftentimes, the bridesmaids are just as anxious about their appearance as the brides are on wedding days. As a notable participant, you’ll want to find a chic hairstyle that does the day justice. However, make sure it’s not too fancy so you won’t outshine the bride. 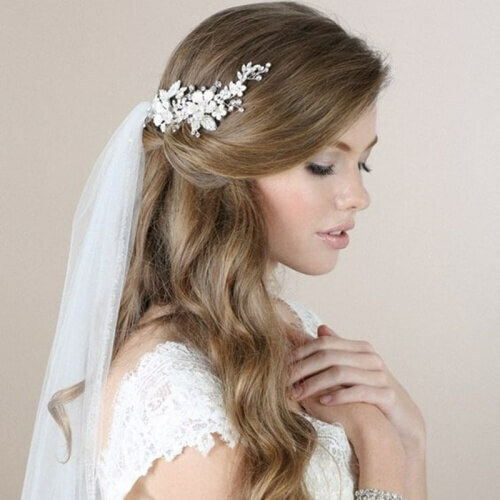 It’s easy to understand why vintage wedding hairstyles for long hair are so beloved among brides. They have a unique sophistication to them that enhances femininity without going over the top. If you want to wear your hair down for your wedding, this is the look for you. Half up half down hairstyles have all the qualities a bride could ever hope for as part of her wedding appearance. They’re stylish and practical, allowing you to easily attach a veil at the part where half of your hair goes up. Style your hair loosely for an effortless outcome. As far as grace is concerned, we can all agree that side swept hairstyles are absolutely enchanting. They’re a wonderful choice for brides with strapless wedding dresses, but also for those who want to add a dash of innocence to their look. We couldn’t have talked about wedding hairstyles for long hair without bringing the chignon into discussion. Without a doubt, it’s one of the most endeared bridal updos, owing to the simplicity and delicate beauty it provides. You should choose it if you plan on wearing bold jewelry. 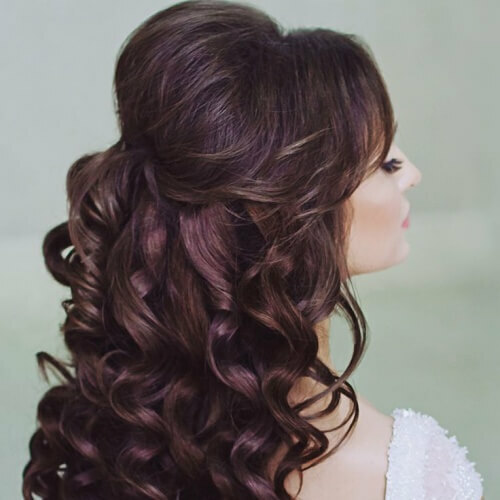 Although you won’t find them nearly as often as curly hairdos among brides, straight hairstyles are a gorgeous alternative. We recommend it for ladies who have naturally straight hair and want to accentuate this part of their look. 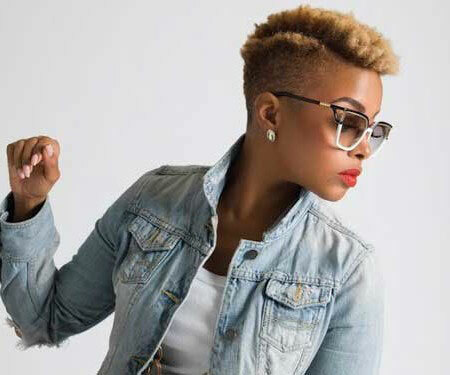 Spice the hairstyle up by adding a hairpiece. Speaking of hair pieces, you can take one and make it the focal point of your appearance. 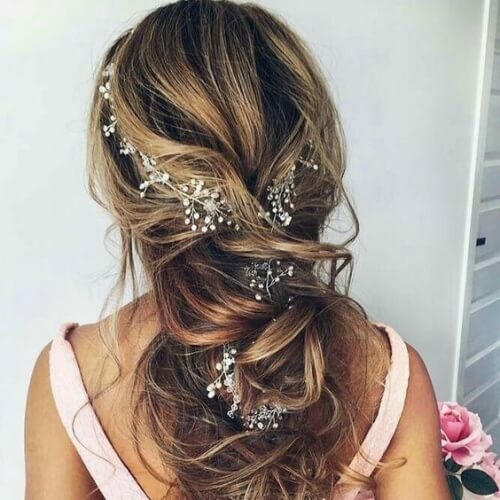 We encourage you to consider a sparkling hairpin for your wedding hairstyle, especially if you plan on keeping your hair down. Tuck your hair behind one ear and place the hairpin above. If you want to feel like a goddess on your wedding day or you’re just looking for a creative hairdo, think about the crown braid. 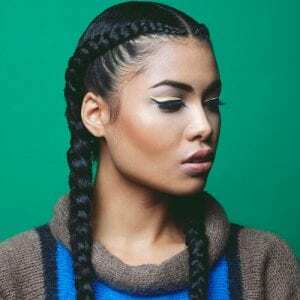 Whether you create your crown hairstyle with one or two braids, choose the braiding technique that best suits your personality. 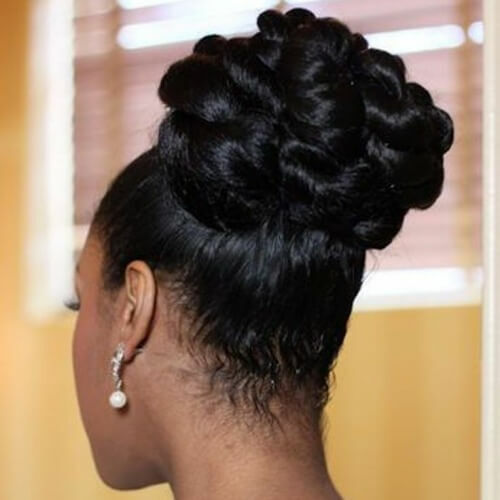 Your wedding day is one of the special occasions that you can think about where to wear an up-do. 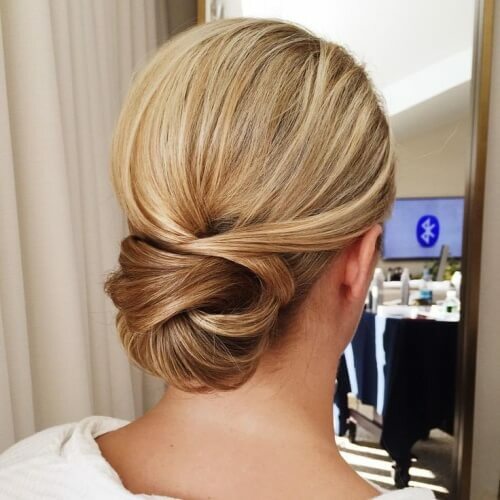 The possibilities are limitless – from simple updos to complex ones, like this twisted chignon-like hairstyle. The small white flowers are the perfect finishing touch. 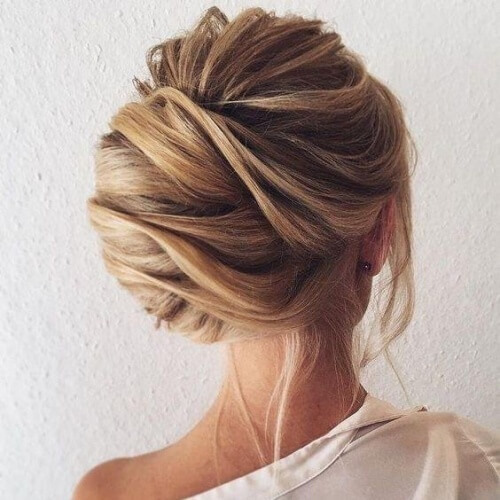 Another updo category you can think about is the high bun. It’s a reliable alternative for brides who want to focus on their veil, without having a half up half down hairstyle. Keep it loose for graceful results, but make sure you add bobby pins in all the right places so it won’t fall apart. 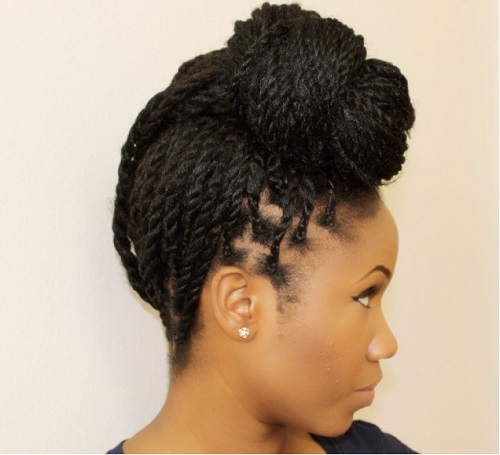 There is a wide range of protective hairstyles available for African American brides. We warmly support natural hair for special events, so you can do some research on braid hairstyles you can adapt for your wedding look. 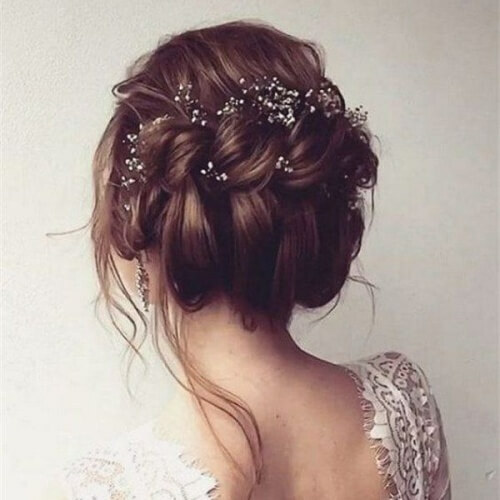 We’ll go back to the idea of simplicity for this example, just so you can see how remarkable these types of wedding hairstyles for long hair can be. Choose a high ponytail to complement a backless dress, and top it all off with some long, chandelier earrings. You can take any half up half down hairstyle to the next level by incorporating braids into it. Part your hair half up horizontally and braid the top part with your favorite method. Use a shimmering clasp in the middle and curl the tips lightly. 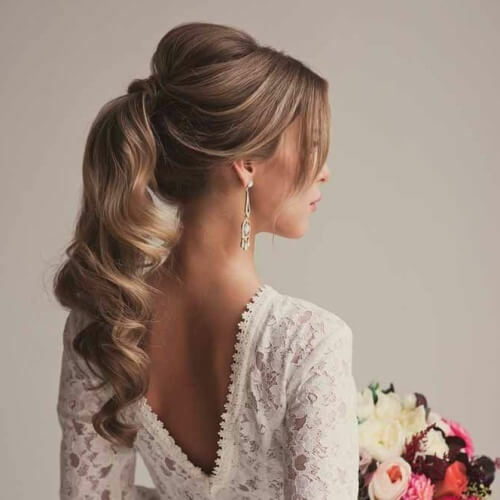 One of the most romantic wedding hairstyles for long hair you can try is the French twist. Widely regarded for its splendor, the French twist graciously reveals the back of your neck and shoulders, but also your face. This way, you can highlight your natural features. As a universal symbol of love, the rose has every reason to make its way into your wedding. 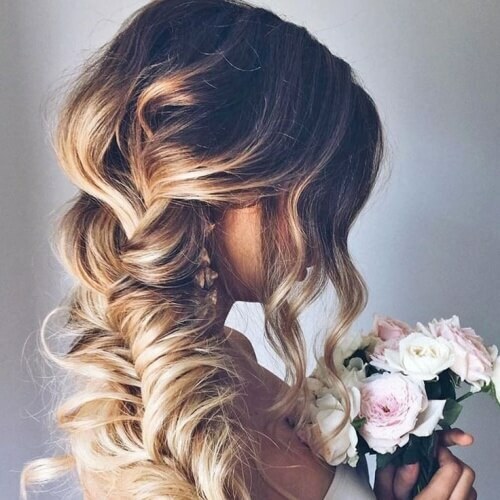 Adding it to your hairstyle can be as easy as styling your hair half up and sprinkling roses in the middle. You can also opt for a spread out approach, with a small rose in random areas of your hair. The faux hawk may seem aggressive by nature, but it can be delightful when styled for a wedding. To tone down the flashiness of the faux hawk, use it only for the top part of your hair. Continue the rest with a long braid and toss it to the side. As a bride, you should always keep the veil in mind when picking your wedding hairstyle. 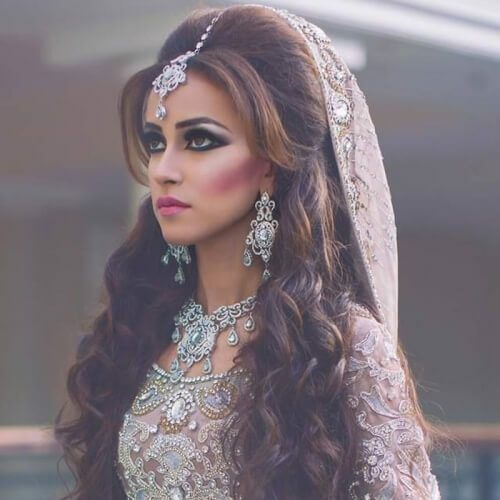 If you want your hair to look marvelous with or without the veil, we recommend choosing from half up wedding hairstyles or long hair. On the other hand, you can try an updo too. 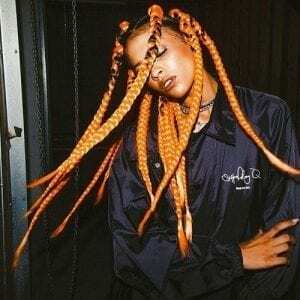 Braids play a brilliant role in making any hairstyle more feminine. 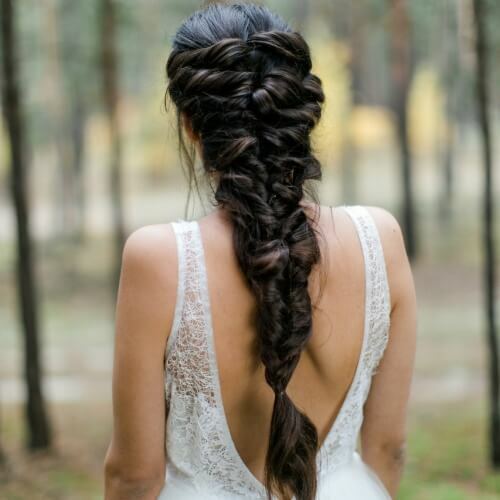 Regardless if you choose a French braid, Dutch braid or a classic 3-strand braid, you can rely on this idea to soften your bridal look. 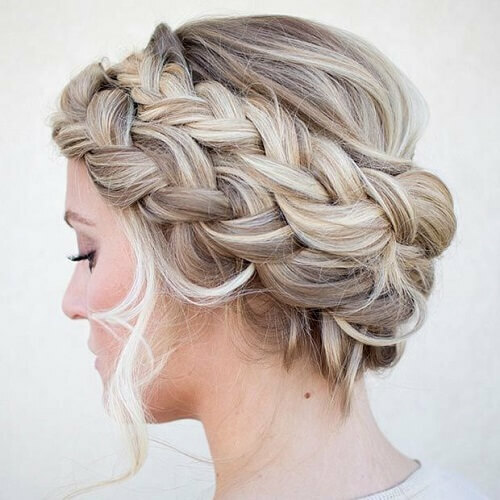 Sweeping the braid to the side is even better. If you don’t want a chignon but a hairstyle that comes pretty close to one, the low bun is just what you need. 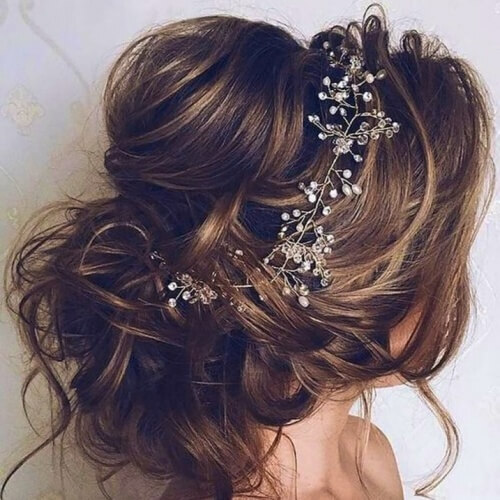 A low bun is also ideal for brides who want a hairstyle with more volume, without going for a traditional updo perched at the crown of their head. Your wedding is an amazing opportunity to express your culture, especially if you have a background with specific traditions. An Indian wedding hairstyle, for instance, shines through the jaw-dropping accessories and bouffant styling. 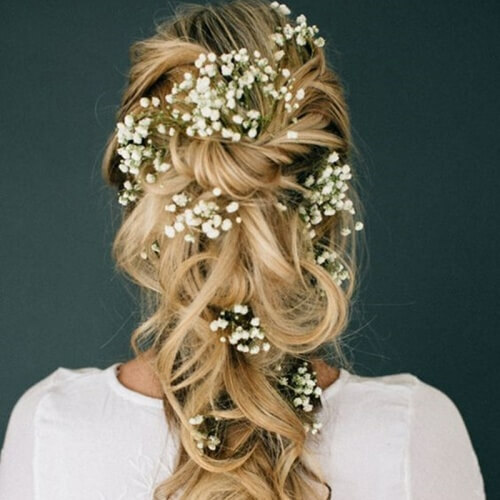 In the past few years, boho wedding hairstyles for long hair have come a long way. Almost any bride that feels drawn to nature will opt for this way of styling, which focuses on natural beauty. Allow your hairstyle to be loose and add any small accessories that inspire you. 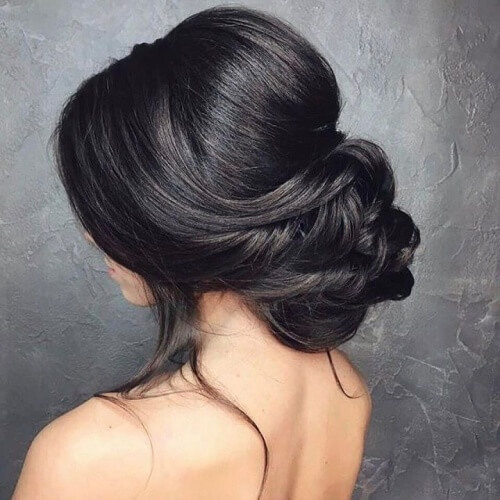 If you believe a chignon is too simple for the way you want your wedding hairstyle to turn out, mix it with another styling technique. For instance, you can work with the top part of your hair and even add a twisted braid to the side. Who ever said that brides should only wear their natural hair color? If you have a lively personality, never hesitate to let it show even on your wedding day. 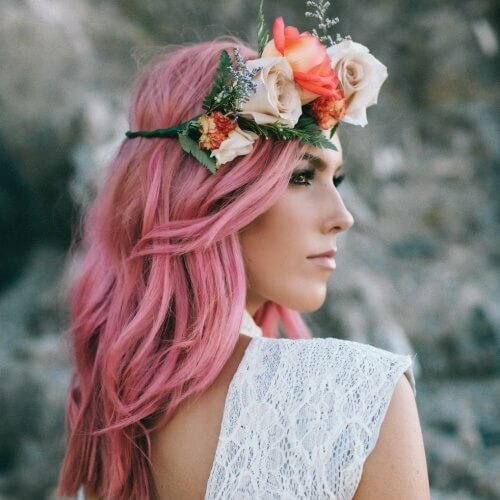 Select a hairstyle that also matches your hair color, the way a boho one goes with pastel pink hair. On the other hand, a classic bride may want to choose a traditional updo as their wedding hairstyle. 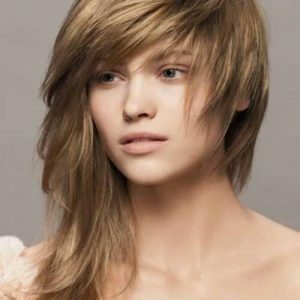 For this look, we recommend working with a professional hairstylist so you get the results you expect. Feel free to use a crystal accessory around your updo for a bit of glam. To continue our idea that you can never go wrong with braids, just take a look at how this fishtail braid glows with charm. We love how the hair is braided loosely, and also that the fishtail braid itself rests over one shoulder. Leave a few strands loose in the front for a sweet effect. What if you don’t have an eccentric hair color, but rather two earth tones blended in an ombre? In this case, you should outline the two distinct shades in your locks. 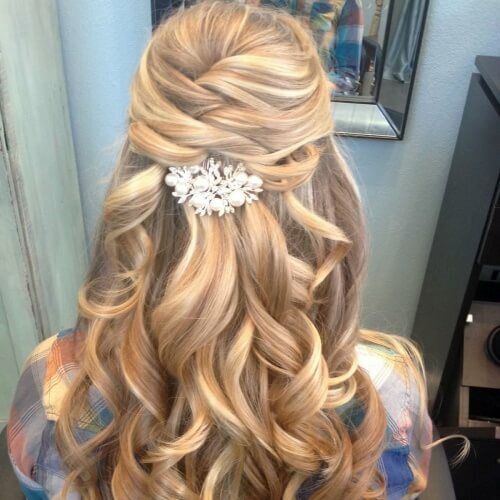 Half up half down wedding hairstyles for long hair are the way to go here too, especially those with braids. In this example, you can see how a low ponytail can flatter a bride with a strapless gown. 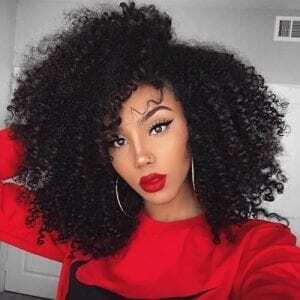 It helps if your hair is naturally straight or wavy, but you can also think about wearing a low ponytail if you have long and loosely curly hair. An easygoing take on the half up hairstyle is pinning your hair back halfway. All you have to do is get a handful of pins, part your hair and use them in the middle section. Glamorize the hairstyle by curling your long strands and gently teasing the top. Aren’t boho hairstyles to die for? If you agree, you’ll definitely enjoy the mermaid braid. If you’re not familiar with the term, this type of braid reflects what the tail of a mermaid would look like. We wholeheartedly recommend it for brides with long and thick hair. Yet another way you can get closer to nature on your wedding day is through a flower crown. Although we encourage you to use a crown made from real flowers, you can use an artificial alternative if you’re afraid they will wilt throughout the day. What happens when you use braids as part of updo wedding hairstyles for long hair? 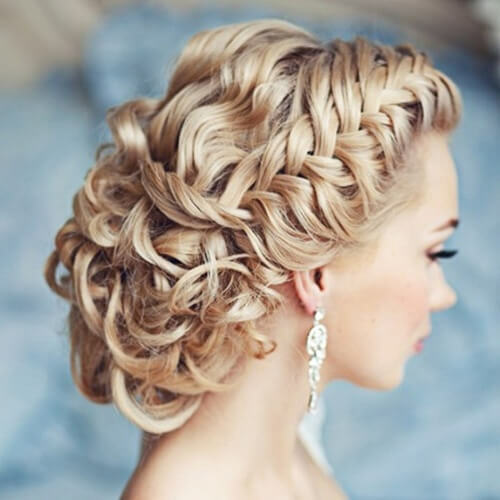 You get a spectacular hairstyle that your guests or future hubby will never forget. Without overdoing anything, experiment with your favorite braid style and twist the ends in a low bun or chignon. We ladies can never quite get enough of having voluminous hair. 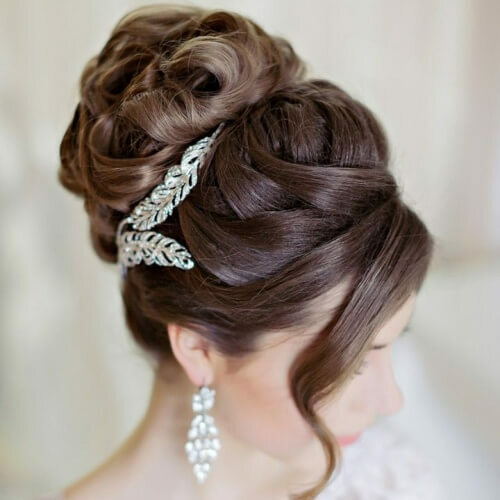 If you agree, you can apply the idea to your wedding hairstyle and use a comb and pins to get a bouffant effect. Ensure that you don’t tease your hair too much, and add plenty of hairspray so it will stay in place. 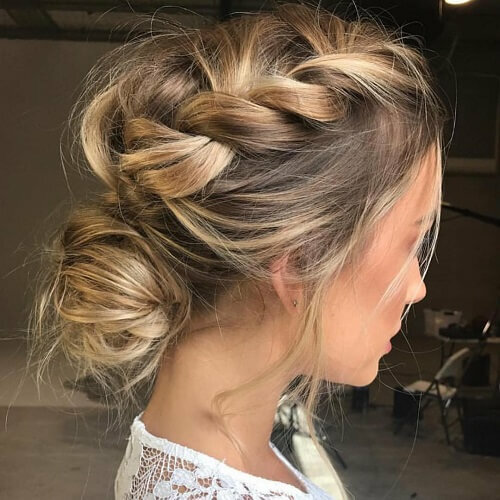 It’s no secret that messy hairstyles are on the rise among hair trends, no matter if you’re prepping for the first day of school or your wedding. 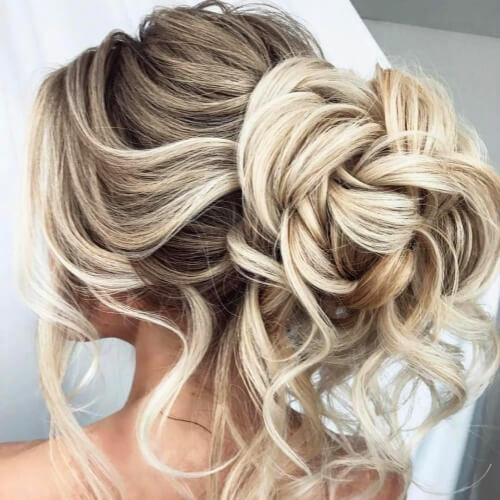 By choosing a messy hairdo, you won’t be as stressed about your appearance and you will concentrate on the memorable day at hand. While many brides choose to braid their hair for their weddings, you can choose to knot yours. 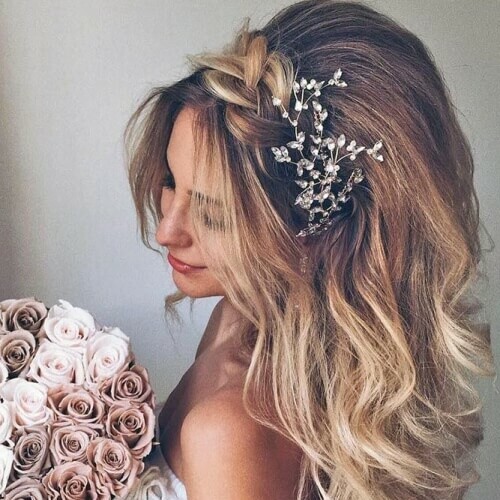 Even though we don’t recommend tightly knotting your locks, you can choose to bring your locks together this way for a unique approach to your bridal hairstyle. 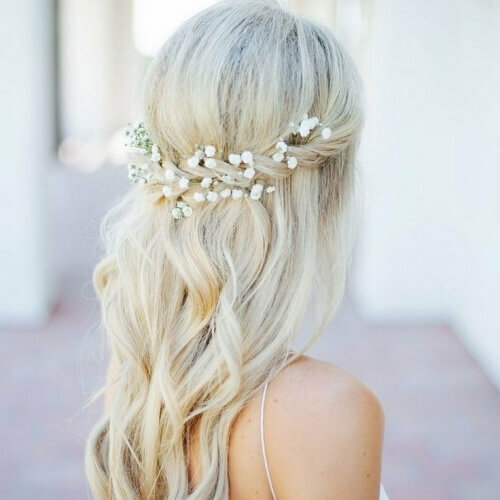 If you plan on getting married on the beach, this is one of the dreamiest wedding hairstyles for long hair you can hope for. A beach wedding is more laid back than a standard one, so you can afford to rock a semi-casual hairstyle that brings out your natural elegance. We also have a terrific idea for brides who will be celebrating their wedding in the great outdoors, in the woods. 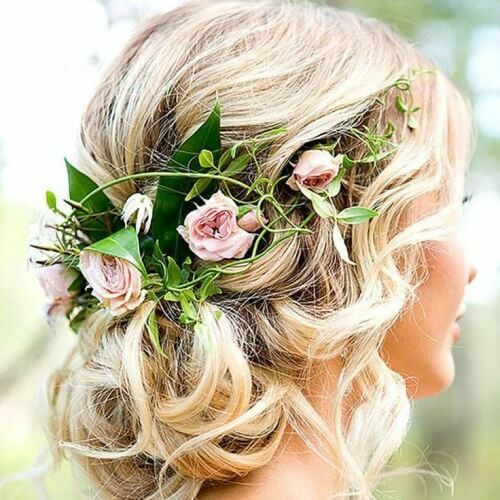 You can pick a hairstyle that reflects the theme of your wedding, adding natural flowers to your hair. They look outstanding with a loose chignon. Updos that use swept up styling have an absolute charm of their own. In fact, they’re one of the most feminine loose hairstyles you can choose for your wedding. Carefully sweep your hair up into the bun you have always dreamed of. If you’re a fan of retro fashion, feel free to be inspired by the 60s and 70s for your bridal hairstyle. Use a wide crown braid instead of a headband and tease the hair in the back as much as you’d like. Any extra accessories are welcome. Brides with naturally curly hair should do all that they can to accentuate their texture on their wedding day. An option is to braid one side and wrap the rest of the curls in tiny ringlets pinned to the back of your head. 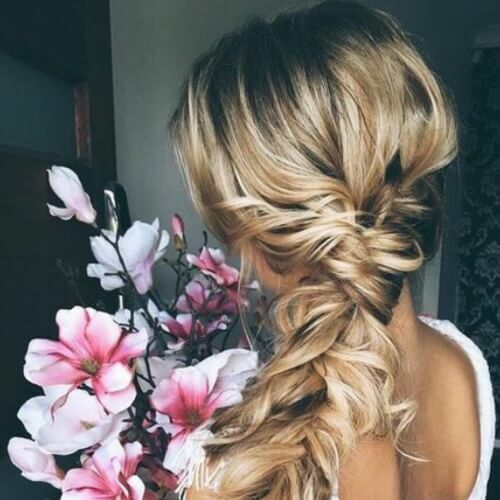 Make sure the braid isn’t too tight so it goes well with the curls. 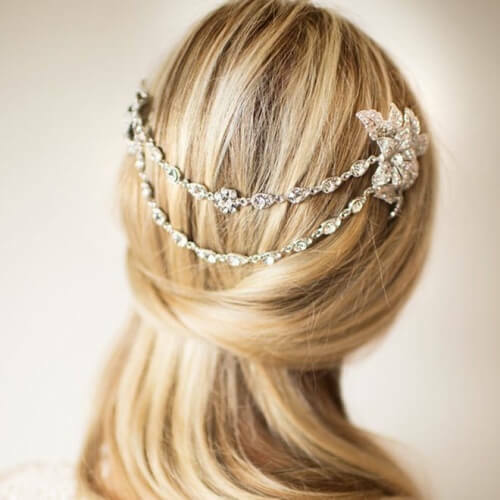 A headband accessory is a fine alternative for brides who don’t want to complicate their hairstyle too much. It can be used to carry a veil without resorting to braids or updos. Choose a thin headband that will maintain the simplicity of your look. 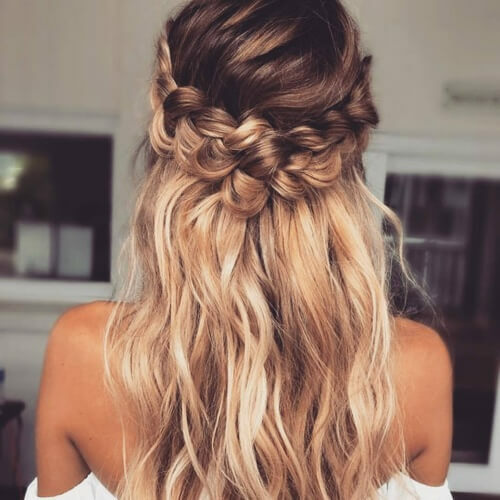 Nevertheless, if you do want to have fun with braids, you can think about using the waterfall technique. Like the name suggests, this method creates a waterfall effect by pulling strands through the main braid. Curl those strands to boost the impact of the hairstyle. 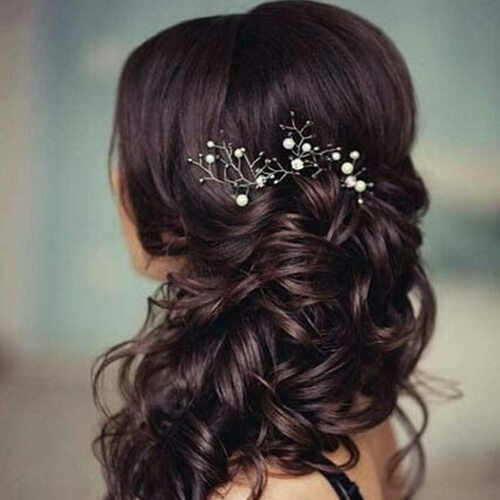 By now, it’s obvious that loose wedding hairstyles for long hair are popular and effective. Owing to the fact that you have long hair, you can leave as many loose locks as you’d like to flow down your back. 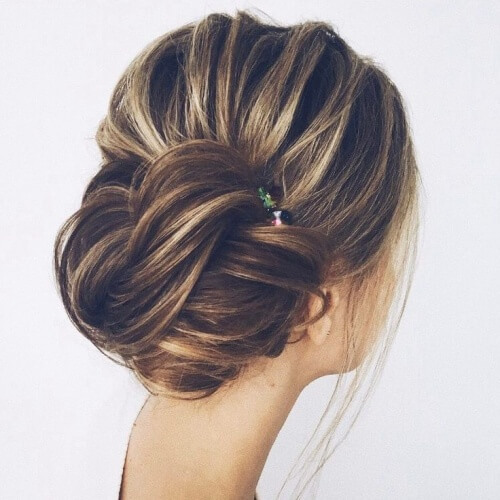 A bun can help you achieve this head-turning hairstyle without much effort. Another way you can rock a braid crown for your wedding is by combining it with a chignon. The top style is also known as lace braiding, thanks to the way it laces your locks together. Like always, allow a few strands to escape in the front and on the sides. As opposed to regular headbands, a tiara will provide an almost royal touch to your bridal look. Of course, you can use a tiara to support your veil, but its main quality is helping you look like a princess on your big day. Additionally, it’s a lovely way to flatter a simple hairstyle. 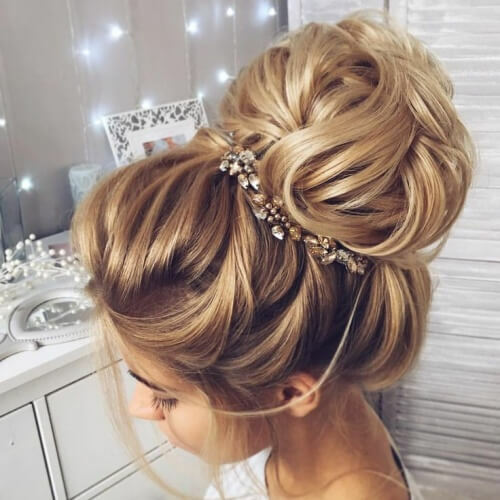 Instead of leaving your hair down and sweeping it to the side, you can look into a side bun as your wedding hairstyle of choice. It will keep you comfortable throughout the ceremony, all while adding a creative twist to a classic hairdo. 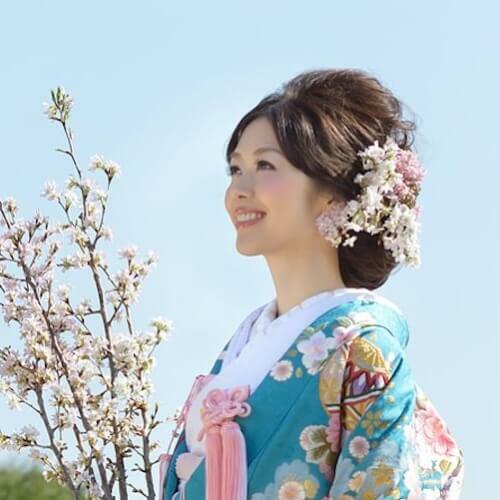 Just like with Indian wedding hairstyles for long hair, traditional Japanese hairstyles look astounding. You can create your entire wedding around this theme if you’re from a Japanese background, complete with a kimono as your wedding dress. The accompanying hairstyle is phenomenal. It’s always fun to match visual elements on your wedding day. As an example, you can use hair accessories in the same color you have for your main decorations. In this case the shade is blue, but you can adapt it to your wedding palette. On the day of your wedding, you have every right to wear your hair in a way that you have always wanted to. Even if this means you’ll have an intricate hairstyle, go for it. 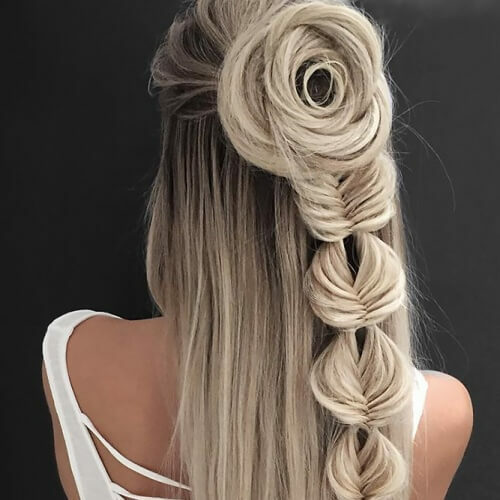 With this example, you can mix a rose braid, fishtail braid and pull through braid in one fantastic hairstyle. 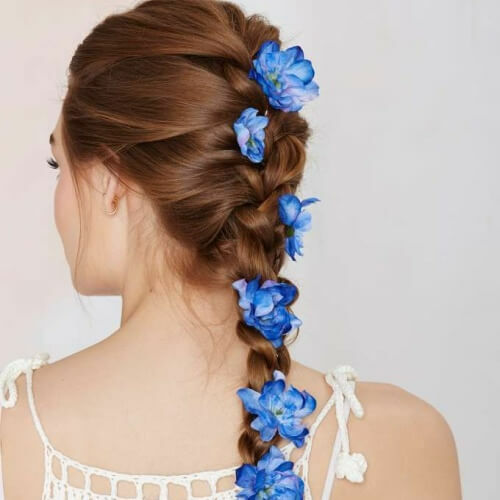 In summary, these wedding hairstyles for long hair will impress even the most selective brides. On the day you tie the knot, you can choose to wear your hair in an updo, with braids or even all the way down with the right details. Before you decide, make sure that your hairstyle complements the rest of your bridal attire. After that, let us know which one you chose. Congratulations and good luck!